The bank had become to historical society. It all started over a few bottles of honey. Many decades ago, an old man I know fell in love with Fain’s honey. It wasn’t available in Baytown, where he lived, but it didn’t matter because he could always get it in Hill Country, and since he made several hunting trips there a year, he just packed in a supply every time he traveled. It was a good system and it served him well for more than 40 years. But as he grew older he found he no longer had the inclination, and eventually even the ability, for the many trips he took when he was younger. His journeys there were fewer and further apart. He still wanted to spend time at the beer lease with his sons and grandsons, if only just to sit around the fire and do the Wild Turkey thing. And he still got his honey. But then his 80s came and even those trips stopped. It wasn’t long before his supply of Fain’s ran out. It was then he thought of me. He had heard I was headed to San Antonio for a conference and asked if I would be willing to make a run into Lowe’s Food Market in Comfort to get him ten or twelve bottles. I told him I’d be happy to. It had probably been ten years since my last trip to Comfort. I remembered it as a quaint little village that had a wool exchange and an egg hatchery. That was about it. But it was big enough to have a weekly newspaper and some beautiful old buildings “downtown,” a couple of blocks off the highway. One of those buildings housed Lowe’s Food Market, a Norman Rockwell image of a 1950s tiny town grocery store. Ten years is not that long of a time and I have a pretty good memory, but when I drove down High Street where I thought I remembered Lowe’s being, I found I was wrong. Thinking perhaps my memory had failed me, I drove down Main Street, then Broadway, the two streets in town that paralleled High Street. Thinking my memory must really be failing, I even drove along 473 to look. Still having no luck, I finally violated the sacred man code and stopped at a gas station to ask directions. The attendant said, “It used to be back on High Street, but it burned down a couple of years ago. Now there’s just a vacant lot there.” He said he’d heard they were planning on rebuilding on Front Street, but as far as he knew, that hadn’t started yet. Accepting that I had failed in my quest, I decided to move on. While I think I do a good job of hiding it, the fact is I have a sentimental side. I like to take out old memories now and then and look at them. Since I had come this far, I figured I might as well take advantage of the opportunity. I got back in the car and drove along High Street again to see if I could find the exact spot where the store used to sit. As I looked more closely at the buildings in the old downtown section, I noticed that the library was pretty much as I remembered it; so were a couple of five and dime-type stores. But almost everything else was different. 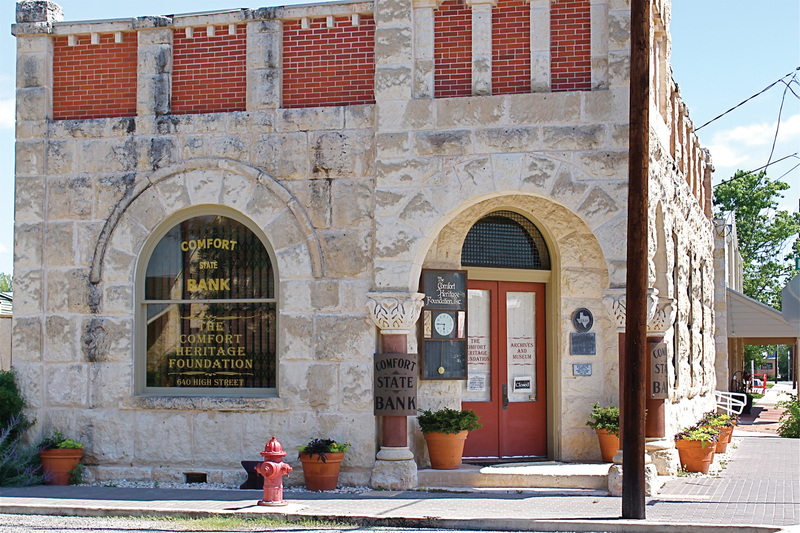 The bank had become the historical society. There was a Beatles-themed bar, three small restaurants, a couple of gift shops and even an ice cream store. None of these were at all familiar to me. Disappointed, I decided to drive on toward Bandera where I hoped I’d be able to find the honey. As I pulled on to Highway 27, I found myself obsessing over the changes I had encountered in Comfort. It was no longer the town I remembered. I suppose to someone seeing it for the first time, it would still be a sweet, quaint little Hill Country town. But they didn’t know the Comfort that I knew—and it made me sad. My God! I was so shook up by that thought that I pulled over to the side of the road to try to calm myself and think this through. Decades ago I heard those exact words come out of my father’s mouth. His general view of life was that the whole world was going to hell in a hand basket. Of course, at the time I just laughed it off. Only the old see the world that way. As a teenager, I thought the world was great just as it was, and the few changes that were happening, I saw as improvements. To a teenage boy, my father might as well have been a space alien. His views were as completely incomprehensible to me, as I’m sure mine were to him. Back then we called it the Generation Gap. But this day, as I drove away from Comfort, I was struck by the realization that somewhere over the years, I had become my father. As time goes on I am beginning to suspect that we are all really more similar than we are different. As I look back on it now, I realize I didn’t become my father at that moment in Comfort; I suspect I have always been him. I just didn’t know it. The idea we had way back then about a generation gap came from a mistake in the way we viewed each other. Quite simply, we had been comparing apples to oranges. Every year Beloit College puts out its “Mindset List” for college faculty. It is a list of the experiences and worldviews of incoming college freshmen that is designed to help faculty understand the critters they are about to encounter. According to the list, for members of the 2015 freshman class, the Daily Show with Jon Stewart has always been the only news program that really “gets it right,” and when they see wire-rimmed glasses, they think Harry Potter, not John Lennon—or John Denver. The list goes on. Obviously, the world seen by these students is radically different from the one I live in. I’m sure these young people see the world as it is today and think it has always been this way. They may see problems, but if they do, they view them as obstacles that were created by previous generations and view any changes that take place as improvements. In essence, they see the world exactly as I saw it at their age. In the late ‘60s, I was a boy of 17 looking at my father, a man of 48. Back then, I had a Fender guitar—he only saw a (expletive) guitar that constantly needed to be turned down. I loved my top 40 music. He heard only noise. Today, I hear a car driving down the road booming and vibrating and think, “turn down that (expletive) radio.” Truth is, it is probably an MP3 player. I wonder—what if, as that teenage boy, I could have met my father when he was 17? I suspect we would have been very similar in our worldviews. Now, several years later, I still haven’t returned to Comfort to see the new Lowe’s Market building. I doubt if it can be as cool as the old one. But then, that is exactly what my father would have said.